Walking the entire Roaming Rotterdam route (approx. 10 km) takes about half a day. It takes about two hours by bicycle (you can rent a bicycle at various locations). You’re naturally also free to opt for a shorter section of the route (see page 23) or take public transport for part of the way. Rotterdam Tourist Information Coolsingel City promotion centre Rotterdam Tourist Information ‘Coolsingel’ inspires and informs you about what’s on offer to tourists and how to spend your free time in Rotterdam. You can go in to get a map of the city or a walking route, tips about going out or information about architecture. Also on offer are the Rotterdam Welcome Card, gifts, gift vouchers, souvenirs, Feyenoord mer­ chandise, and tickets for entertainment and transport. Temporary exhibitions and a large model of the city centre give an idea of the latest (architectural) developments in Rotterdam. Rotterdam Welcome Card The Rotterdam Welcome Card offers discounts of 25% and more at 50 attractions, museums, restaurants and places of entertainment in Rotterdam and 1, 2 or 3 days of unlimited travel with RET metro, tram and bus. Available at Rotterdam Tourist Information Coolsingel and Rotterdam Tourist Information Central Station or order it via www.rotterdamwelcome­card.com. See more, pay less! Welcome to Rotterdam, the city that enjoys growing inter­ national acclaim as a popular destination for city trips. Why? You’ll find out for yourself as you roam through Rotterdam. The walking route brings you past iconic architecture and shows the eclectic mix of old and new that has made Rotter­ dam so famous – from the Late Gothic architecture of the Laurenskerk to the futuristic Markthal. From the Cube Houses on Blaak to the gleaming high-rise buildings on the Kop van Zuid peninsula. The route also takes you through residential neighbourhoods, parks and shopping streets and along sidewalk cafés, museums and the waterfront. From Erasmus Bridge you’ll enjoy the view of the Maas River and the water taxis and ships sailing by. You’re looking out at one of the world’s biggest ports – not to mention that spectacular skyline that Rotterdam is famous for. Have lots of fun exploring Rotterdam!  T  ips about the route are provided in the margins. Some signs may not be easy to see at the busier inter­sections.  here the bicycle route W deviates from the walking route, a note has been added in the margin. The alternative route is shown on the map as a dotted line, but there are no street signs marking it. Rotterdam is an authentic melting pot. The city is home to 176 different nationalities, and that international mix is reflected in the city’s many exotic restaurants and shops, famous festivals like the Summer Carnival and North Sea Jazz, but above all in the wide-ranging diversity of the people who live here. The atmosphere is open and cosmopolitan, offering fun options that cater to every taste. Many new hotels, restau­ rants, coffee bars and clubs have opened in recent years, often at exciting locations. Rotterdam’s dynamic, cosmopolitan character is most pal­­ pable on the waterfront. The ships you see in the port come from all over the world, and the architecture around the Maas River is internationally acclaimed. The soaring high-rise struc­ tures designed by famous architects like Álvaro Siza Vieira and Rem Koolhaas are along the river, not to mention the famous Erasmus Bridge designed by UNStudio. The juxtaposition of old and new architecture – high and low, long-standing and still under construction – is a familiar sight for Rotterdam locals. It’s an intrinsic aspect of the cityscape in a metropolis that never stands still and never fails to fascinate its visitors. Rotterdam, then and now Rotterdam formed around the Binnenrotte, where the little Rotte River once flowed. A dam was built here around 1270, becoming the centre of a small fishing village. Trade and shipping flourished and ‘Rotterdam’ grew rapidly. The Nieuwe Waterweg channel was excavated between 1866 and 1872, giving Rotterdam a better connection to the sea and allowing it to grow into a truly worldclass city. On 14 May 1940, during World War II, almost the entire city centre was destroyed by bombardments. The ‘fire boundary’ is still marked today by small lights in the shape of red flames embedded in the pavement. The people of Rotterdam were pro-active and hands-on; reconstruction planning started just days after the borbardment. The city had the courage to make a radical break with the past, opting for spacious design and modern architecture. Light, air and space were the watchwords. In the decades that followed, Rotterdam continued its commitment to ground-breaking architecture, creating the contemporary image the city has today. That drive for innovation is still characteristic of Rotterdam’s own. The skyline is interna­ tionally acclaimed as an ‘ode to modern architecture’, and there’s so much more to discover here. Rotterdam: a definite must-­see? Absolutely! The signposting begins on Rotter­ dam Central Station square. The first signpost is located under­ neath the tip of the station’s v-shaped roof. 1. Rotterdam Central Station Team CS* (2014), M. Struijs (2014) Nearly 110,000 travellers pass this spot every day to take the bus, tram, metro or train. The roof over the tracks is partly covered in solar panels and transitions smoothly into the roof over the station hall. Its tip points towards the city centre. A number of historic elements from the former station building (1957) designed by Sybold van Ravesteyn have been retained, such as the original clock on the façade, the letters spelling out Central Station and the ‘speculaas cookies’, two granite sculptures above the entrances of the cycling tunnel. The underground metro station and bicycle parking facility were designed by Maarten Struijs. The low tower is 93 metres high, while the highest section soars to 151 metres. The building has 28 lifts. 4. Calypso Alsop Architects (2012) The façade of Calypso is designed so the building appears to be floating. Its 22 floors contain 407 luxury apartments as well as shops, offices, cafés and restaurants, and a car park. At the far right, you’ll see the reno­ vated Pauluskerk (rust brown), where assis­ tance to the city’s homeless and addicts. 5. Schouwburgplein A. Geuze (1992-1997) Acclaimed and denounced in equal measure by architecture critics all over the world, the square was built on the roof of a parking garage. Various materials were used in its construction, including an epoxy floor, steel and natural stone plates, and wooden flooring. The bent red lamp posts are evocative echoes of dockside cranes. The square is lined in sidewalk cafés, restaurants and theatres. 2. Groot Handelsgebouw H.A. Maaskant and W. van Tijen (1953) This national monument is a typical symbol of post-war reconstruction in the early 1950s. The huge structure, 220 by 84 metres in size, was built in the early 1950s to accommodate businessmen who had lost their premises during the bombardment. It was and is the biggest trade centre in the Netherlands. There are offices and shops distributed across various levels, with a 1.5 kilometre ‘road’ through them. With over 170 tenants, the building is a small town in itself and is a leading meeting place for national and inter­ national entrepreneurs in Rotterdam. Bar Brasserie Engels is located on the Central Station Square side of the building. 3. Delftse Poort A. Bonnema (1991) Until 2005, the Delftse Poort and its mirrored façade was the highest building in the Nether­ lands. Although higher buildings have risen in Rotterdam since its construction, this one is still one of the city’s prominent landmarks. 6. De Doelen E.H. and H.M. Kraaijvanger with R.H. Fledderus (1966) / J. Hoogstad (2000) De Doelen Concert Hall and Conference Centre hosts many concerts every year, encompassing every genre, from classical to world music and jazz. The acoustics of its concert halls are widely praised. De Doelen is also home base for the Rotterdam Philhar­ monic Orchestra. The building was expanded in 2000 to include additional con­ference facilities and the HMD School of Music and Dance. Follow the route outside the pedes­ trian zone and pick up the route again at number 15.
built. An ultralight structure was needed due to the car park located under the complex. A light steel construction was used with cladding made from smooth plastic plates. After a large-scale renovation, there are ‘old-fashioned’ billboards on the roof again. 8. Rotterdamse Schouwburg W.G. Quist (1988) The municipal theatre presents many theatre, dance and music performances every year. The Schouwburg is also a popular festival location. The floor plan is almost symmetrical: stately staircases sweep from the entrance (right below the theatre tower) and along the main theatre to the foyer at the back. Scenery pieces are brought in and taken out again using an ingenious freight lift on the right of the building. 9. Lijnbaan J.H. van den Broek and J.B. Bakema (1953) Lijnbaan is one of the most frequented national monuments in Rotterdam. In the 1950s, when it was the first car-free shop­ ping promenade in Europe, it was seen as a revolutionary design and copied all over the world. Lijnbaan is still a shopping valhalla. The shops here are open seven days a week. 10. City Hall H. Evers (1920) City Hall was one of the few buildings to survive the bombardment in 1940. Queen Wilhelmina laid the first stone in 1915. The listed building in Beaux Art style with Byzantine, Roman and Art Deco in­fluences is symmetrically structured around an inner courtyard which can be reached via the street that ‘intersects’ City Hall. The richly deco­rated façade features various sculptures. The mayor’s office is on the first floor of the right corner pavilion. Take a detour and visit the Rotterdam Tourist Information in the garden of the Schielandshuis. In the basement, you can visit ‘Rot­ terdam Discovery’; a journey through the city’s past, present and future (free entry). 11. Beurstraverse The Jerde Partnership, P. de Bruijn (de Architekten Cie) (1996) The sunken shopping passage, referred to locally as the ‘Koopgoot’ (‘shopping gutter’), crosses under Coolsingel. The traverse links two important shopping streets, Lijnbaan and Hoogstraat, via the Beursplein underground metro station. The interior of the traverse was designed by Jon Jerde, the American guru of fun-shopping. 12. De Bijenkorf M. Breuer, A. Elzas (1957) The façade of this luxury department store is partly clad in hexagonal travertine panels that reference its beehive logo. The architect wanted to place an artwork in front of the entrance so he wouldn’t have to adapt his design to the urban development plan that required an extension on the front of the buil­ding. The store sells exclusive fashion and cosmetic brands, but also interior accessories, bonbons, books and toys. 13. Zonder Titel / Untitled N. Gabo (1957) 26.2 metres high and weighing 40 tonnes, this steel artwork known as ‘Untitled’ stands outside the entrance to the Bijenkorf as an ‘ideological contribution to constructivism’, as Gabo himself put it. Despite its massive bulk, the sculpture creates an impression of weightlessness. 14. Beurs-WTC J.F. Staal (1940), R. van Erk (1987) The lower building of the stock exchange was the first building in Rotterdam to be restored to its former glory following the 1940 bom­ bardment. The World Trade Center, the office building in the form of a flattened ellipse, was built on top of the exchange hall in 1987. 15. De Meent De Meent has blossomed into the most glamorous street in the city. A better class of fashion and shoe stores is supplemented by a number of good restaurants, lunchrooms, bars, cocktail lounges and a famous ice cream salon. 19. Erasmus H. de Keyser (1622) The statue of Desiderius Erasmus is the old­ est public statue in the Netherlands. As one of the most important humanist philosophers, Erasmus is world-famous. He was born in Rotterdam around 1468 and has come to symbolise the city of his birth. 16. Post Rotterdam G.C. Bremer (1923) Like City Hall, the former post office survived the bombardment of 1940. The exterior seems fairly sober and solid. The interior, in contrast, is light and high and still retains many historic details. The sculpture by Joop van Lunteren on the façade still provides a symbolic reference to the building’s former function: post office, telegraph office and telephone services. Redevelopment of the building into a hotel, wellness centre and shopping area will commence in 2019. 17. Timmerhuis R. Koolhaas (OMA) (2015) The Timmerhuis city office is located behind City Hall and Post Rotterdam. The building’s reno­vated section and new addition mesh seamlessly. This architectural masterpiece of glass and steel houses both municipal offices and apartments, shops, cafés, restaurants, the Rotterdam Museum and a car park. 18. Café Brasserie Dudok W.M. Dudok (1953), H. Kossmann and J. Dijkman (1991) Once an insurance firm, it is now a lively meeting point named after the building’s architect. Traces of the original structure of the glass-walled offices can still be seen in the large open space, as well as many authentic details. Maisonette apartments are situated above the café. 20. Laurenskerk Unknown (between 1449-1525) The Late Gothic church is the only building still remaining from the medieval city centre. The church received its current shape around 1525, but took heavy damage during the bombardment in May 1940. It now stands in striking contrast to the new architecture that surrounds it. Besides its regular church services, the building now also hosts tours, concerts, exhibitions, lectures and events. The Laurenskerk tower can be climbed on Wednesdays and Saturdays from April to October. Take the alternate route on market days, or get off your bicycle and take a short walk. 23. Central Library Van den Broek & Bakema (1983) The Central Library has approximately 400,000 books distributed cross six floors. The yellow pipes provide a flow of fresh air into the library. A quote by Erasmus, accom­ panied by his signature, graces the façade: ‘The whole world is my homeland’. At the first Cube House, take the steps on the left and head up. Walk between the houses and take the stairs on the right down to the water. Walk along Oude Haven to the left to get the best view. 24. Markthal MVRDV (2014) Covered market halls are found in various cities around the world, but the way this mar­ ket is com­bined with housing is unique. The apartments are draped over the daily market in a horseshoe shape. The main hall houses the market itself, as well as shops and various restaurants, with a supermarket and a fourstorey car park situated below. As you wander along the market stands, look up to see Arno Coenen’s and Iris Roskam’s ‘Horn of Plenty’. Follow the alterna­ tive route; cycle under the Cube Houses along the right side of the road, then take the red cycle path to the right Koestraat 50 metres later. 25. Blaak Station H.C.H. Reijnders (1993) Between 1987 and 1993, the rail viaduct and rail bridge were replaced by the Willemsspoor Tunnel. From that point on, train traffic through this area was underground. Blaak Station is part of this sub­­terranean line. Only the station’s tram stops can be seen from street level. The metro tracks are at -1, and the rail tunnel for national and inter­national trains from Rotterdam to the south and vice versa is situated another level down. A frag­ ment of Rotterdam’s fourteenth-century city wall is on display in the station. Follow the bicycle route to the end of Wijnhaven. At the end of Wijn­ haven, take the Kraneschipbrug across the water to Schiedamsedijk. Walk right beside the quay (there are stairs at the end) or along Schiedam­ sedijk. 30. The Red Apple KCAP Architects & Planners (2009) The apple market was historically held at this location. An old apple tree along the water­ front still stands as a reminder. The name of the residential high-rise and office building recalls that piece of history and offers a play­ ful reference to the Big Apple, New York City. The bright red lines in the 127-metre tower narrow as they rise up the façade, emphasis­ ing the building’s sleek shape. Cycle across via the right side of Erasmus Bridge. Turn right at the end. Walk across via the left side of Erasmus Bridge. Turn right at the end. 31. Verwoeste stad (The Destroyed City) O. Zadkine (1951) This bronze artwork is the city’s main war monument. The sculpture represents a human figure without a heart, symbolising how Rotterdam was cut to the heart by the German bombardment in World War II. 32. Water taxi The ultimate way to travel from A to B and savour the authentic flavour of maritime Rotterdam is the water taxi. These fast boats offer passenger transport seven days a week from various boarding points. You can opt for a shorter walking route by catching the water taxi from the Kraneschipbrug dock to Hotel New York and continuing the route from there. 33. Maritime Museum Rotterdam W.G. Quist (1986) The oldest shipping museum in the Nether­ lands curates a collection comprising half a million maritime objects. Its diverse exhi­ bitions include MainPort Live, an impressive multimedia presentation about the dynamic port city of Rotterdam. Outside, on the Leuvehaven quay, you can admire ships, dock cranes and other port-related exhibits dating back to the period between 1850 and 1970.
this complex of three buildings was designed by two architecture firms. The natural grey stone building at the front accommodates courtrooms and a detention complex oper­ ated by the judiciary (Ligtvoet). The large complex in red brick (Dam & Ligtvoet) is located immediately behind it and houses the offices of the court, the tax authorities and the customs authorities. The high-rise building on the left (Dam) is occupied by various companies. The Galleria connects the buildings. The courtyard behind them was designed by West 8. This building-free zone is immediately above the metro tunnel. 41. Cruise Terminal Brinkman & Van den Broek & Bakema (1938 and 1949) Between 1873 and 1970, thousands of passengers headed off for America from this spot. The halls were largely destroyed during the war. The former departures hall (1938) and arrivals hall (1949) of the Holland America Line were fully restored, however, and are now considered industrial cultural heritage sites. Since 1997, the arrivals hall has been redubbed Cruise Terminal and used as an events venue. Many cruise ship passengers still enter the city via this terminal every year. 39. Toren op Zuid R. Piano (2000) The Italian architect allowed the surface of this office tower to lean forward as an echo of the suspension cables of Erasmus Bridge. The giant light installation on the façade consists of 900 tiled flat lamps, together forming a screen that displays various images and texts. Fun detail: the slope is nearly 6 de­ grees, identical to the leaning Tower of Pisa. 42. Las Palmas Van den Broek & Bakema (1953), Benthem Crouwel Architects (2007) The building that once housed the industrial workshops of the Holland-America Line from 1953 stands in the middle of the Wilhelmina­ pier. Built in 1953, the historic building was redeveloped in 2005 and now houses several institutions, including the Nederlands Foto­ museum with its varying exhibitions of historic and contemporary photos from the Nether­ lands and abroad. During the redevelopment, a penthouse office was added on the roof. 40. De Rotterdam R. Koolhaas (OMA) (2013) Together, the three linked towers soar to nearly 150 metres high and form a ‘vertical city’ of high-class flats, a 4-star hotel, offices, shops, restaurants, fitness and parking. The building stands on a plot of land the size of a football field and was constructed according to stringent standards of sustainability. The name refers to the ss Rotterdam steamboat, which once took regular trips to New York and incorporated many luxurious amenities to ensure the comfort of its passengers. 48. ss Rotterdam (1959) The steamship ss Rotterdam is the former flagship of the Holland-America Line and boasts a wealth of history. The ship (228 metres long, 28 metres wide and 61 metres high) was built in Rotterdam, retur­ning to its home port in 2008 after many pere­grinations and nautical miles. Since then, it has been moored alongside Katendrecht and used as a hotel, restaurant and events venue. The terrace on deck offers a unique view of the city. An audio tour guides visitors through the authentic details in the restored lounges and decks and offers a peek at the engine rooms. thentic details in the building are reminiscent of the early twentieth century and recall its ties to the maritime world. Firmly grounded in history, HNY offers the height of modern luxury. There is a dock beside HNY. Extend the route by taking the water taxi to the ss Rotterdam, or take an extra fifteen-minute walk across the Rijn­ havenbrug. If you’d rather shorten the route, take the water taxi to Veerhaven (number 53). 45. Lost Luggage Depot J. Wall (2001) The cast-iron monument filled with suitcases and bags from various eras references this location’s history as a departure terminal for America. The monument with its lost luggage symbolises how people cut their ties to their homelands and sailed off, saying their fare­ wells here. 46. Montevideo Mecanoo Architects (2005) Work, home and leisure in a single spot. That was the guiding principle behind the develop­ ment of this tower: a city within a city. Luxury apartments are located in both towers. The middle section is reserved for offices and a health club. Various cafés, restaurants and catering options are on the ground floor. 47. Katendrecht The Katendrecht peninsula, known locally as the Cape, was once a notorious dockside area and red light district with a sailor’s pub on every corner. This area has been extensively redeveloped and is now very hip and happening. The Fenix Food Factory is a fresh produce market and culinary hotspot where you can buy and taste locally produced and sourced delicacies. There is a diverse range of restaurants and outdoor cafés on Deliplein square. Katendrecht is easy to walk to from Wilheminapier across the Rijnhavenbrug. 49. New Orleans A. Siza Vieira (2010) The lower two floors of New Orleans are home to LantarenVenster, the definitive theatre for a better class of films, concerts, jazz music and festivals. Apartments, a health club and a car park are located in the tower. The natural stone façade gives the building a warm feel. Walk back via the left side of the bridge. Right be­ fore the end, take the stairs down to continue the route. Cycle back via the right side of the bridge and follow the road signs and map. tours of the port these days. The city’s archi­ tecture, its skyline and the port activities are seen to their best advantage from the water itself. Spido also offers tours to the new Maasvlakte 2 seaport. 52. Wereldmuseum A.N. Godefroy (1851) The building was decorated by the Royal Yacht Club, established in 1846 by Prince Hendrik. Since 1885, the Wereldmuseum has occupied the premises. This prominent ethno­ graphic museum has 2000 top pieces from all over the world in its permanent collection. It also hosts a range of high-profile, temporary theme exhibitions. The museum’s restaurant holds a Michelin star. 53. Het Scheepvaartkwartier This romantic corner of Rotterdam is a protect­ ed urban landscape. The city’s rich maritime history lives on here in stately town houses lining beautiful lanes, not to mention Het Park and broad waterfront quays. The Veerhaven harbour is currently home port and stop-off point for historic ships that still sail the seas. At the end of Scheepstimmer­ manslaan, first cross the West­ zeedijk. Then turn left to follow Westzeedijk. Turn right just be­ fore Kunsthal and cycle underneath it. Then turn right. Cycle between the Kunsthal and Het Natuur­historisch Museum into Museumpark. Follow the alterna­ tive route in the park. 54. Het Park J.D. Zocher jr. and L.P. Zocher (1862) A green oasis in the heart of the city. Het Park is a beloved spot for relaxation and barbecues in summer. All sorts of festivals and events are held here. 55. Euromast H.A. Maaskant (1960) The Euromast was designed for the Floriade world flower show in 1960 and is the highest observation tower in the Netherlands. The observation deck at 100 metres offers a restaurant with a 360-degree panorama of the city. Take it to the next level and board the rotating Euroscoop lift to go all the way up to 185 metres. From the dyke, take the passageway that leads directly through the Kunsthal to Museumpark. 63. Chabot Museum G.W. Baas & L. Stokla (1939) The museum in the white corner villa – a monument to Dutch modernist architecture in its own right – displays paintings, draw­ ings, sculptures and graphic works by famous Rotterdam-based artist Henk Chabot. Works by his contemporaries and kindred expres­ sionists from the Netherlands and abroad are also on display. a medical faculty for education facilities, research labs and a car park. In 2009, construction was started on a new hospital building that was put into operation in May 2018. The new Erasmus MC, with an area of over 300,000 m2, is ready for the future! 60. Museumpark + car park R. Koolhaas, Y. Brunier (1993, 2011) / P. de Ruiter (2010) The Museumpark is divided into three zones: a paved zone on the Kunsthal side, a romantic zone with trees and a pedestrian bridge, and an asphalted city zone for events. The car park (De Ruiter) underneath the Museumpark uses split levels and lots of glass for a light, spacious and transparent look. The Depot Boijmans Van Beuningen will be built in the park in the coming years. It is the first depot in the world that provides access to a com­ plete collection, without the intervention of a curator. 61. The New Institute J. Coenen (1993, modifications in 2010) The striking building houses a museum of archi­­tecture, fashion, design and e-culture. Besides its archives and library, it also includes a bookshop and a cosy museum café on the waterfront. 62. Sonneveld House J.A. Brinkman & L.C. van der Vlugt (1933) The Sonneveld house is one of the bestpreserved examples of Dutch modernist architecture. The use of new materials and a steel skeleton express the modernist princi­ ples of light, air and space in very spacious living areas with large ribbon windows and a roof terrace. As part of the New Institute, the Sonneveld house is a museum home open to the public. Cross Westblaak and turn left. Cycle past the skate park Turn right on Eendrachtsplein. 64. Museum Boijmans Van Beuningen A. van der Steur (1935) / A. Bodon (1972) / Daem & Robbrecht (2003) This is one of the oldest museums in the Netherlands. The collection of Dutch and European master-pieces offers an overview from the Early Middle Ages to the 21st cen­ tury. Van Bosch, Rembrandt and Van Gogh to Dalí and Dutch Design. The renovation of Museum Boijmans van Beuningen will begin in 2019. The intention is that the museum will open elsewhere in Rotterdam during the closure to temporarily show (parts of) the collection. 65. Sylvette P. Picasso (1970) Sandblasted in concrete, this portrait of 20-year-old Sylvette, the girl Picasso met in the spring of 1954 who became his muse, is a collaboration with Norwegian artist Carl Nesjar. 66. Witte de Withstraat The ultimate arts and culture street in Rotter­ dam is known for its artistic, multicultural and lively character. Referred to as the city’s ‘Axis of Art’, it runs from Museumpark to the Mari­ tiem Museum and is lined in galleries, avantgarde fashion bou­tiques, restaurants and (art) cafés. SHORT ROUTES No time to take the whole walk? 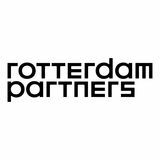 Or are you simply interes­ ted in a specific aspect of downtown Rotterdam? Opt for a shorter route and combine it with public transport from Central Station. Purchase a public transport chipcard (or top up your current card) at Central Station or one of the metro stations. 67. Oude and Nieuwe Binnenweg Oude Binnenweg, and Nieuwe Binnenweg leading on from it, form one long trail filled with surprising shops and entertainment venues. Pubs, cafés, night bars and restau­ rants line the roads. Art & design aficionados will also enjoy the area’s various furniture and design shops. Skyline This part of the route features the most beautiful views in Rotterdam: the skyline, the port, the architecture of the Wilhelminapier. Regardless of which Maas riverbank you’re on, you will enjoy the stunning panoramas of the varied décor. Route: From Central Station, take tram 20 (towards Lombardijen), 23 (towards Bever­waard) or 25 (towards Carnisselande). Get out at Leuvehaven. Start the route at number 34.  Shorten the route further by catching the water taxi from Hotel New York to Veerhaven and continuing the route from number 53. Arts & Culture Love arts and culture? Curious to explore Rotterdam’s museums and public art? Make sure don’t miss this part of the route, which takes you past Museum Boijmans Van Beuningen, Kunsthal Rotterdam and the Westersingel sculpture route. Route: From Central Station, take tram 7 (towards Willemsplein). Get out at Westplein and start the route at number 52. 70. De Unie C. Weeber (1986) inspired by J.J.P. Oud (1925) De Unie has an eye-catching façade. De Stijl colours, rectangular advertising signs, a billboard and square windows create an exceptional com­­position. This is not the original façade designed by J.J.P. Oud, but a replica. The original building on Coolsingel was destroyed in the 1940 bombardment. In 1986, the façade was reconstructed by Carel Weeber at a new, comparable location between 19th-century buildings. In Veerhaven (number 53), you can take the water taxi to ss Rotterdam or catch tram 7 (towards Woudestein) to Central Station. Heart of downtown If you mainly want to explore the dynamic city centre, with all its shops, restaurants and ca­ fés, then limit your walking route to down­ town Rotterdam. You’ll stroll down fun, lively boulevards and shopping streets and end up on the Binnenrotte, the site of Rotterdam’s earliest origins. Route: Follow the marked route from Central Station to number 25. When you reach Blaak Station, take tram 21 (towards Woudhoek) or 24 (towards Holy) back to Central Station. A visit to the Kunsthal is a fascinating journey along modern masters, contemporary art, photography, fashion and design. The Rotterdam Tourist app Experience the best of city & port with the Rotterdam Tourist app! The app highlights the best sights, attractions, museums, shops, restaurants and clubs in the city. Includes events calendar, a city map, public transport planner and overview of Wi-Fi spots. Works on and offline! 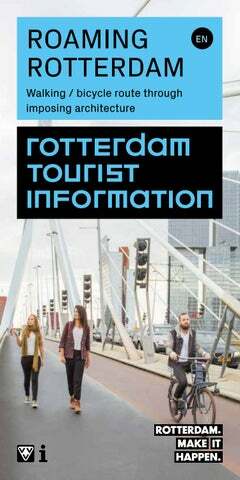 Available for iOS and Android, to download search for ‘Rotterdam Tourist Info’ in Apple app Store or Google Play. 2018 Edition Cover photography: Sophia van den Hoek Photography: Hannah Anthonyz, Jan Bijl, Claire Droppert, Ossip van Duivenvoorde, Marc Heeman, Daniëlle van der Schans, Guido Pijper, Tot en Met Ontwerpen, 500 Watt. Text: Elsbeth Grievink, Tot en Met Ontwerpen, Rotterdam Partners Translation: Joy Maul-Phillips Design: Glamcult Studio Printing: Print Power Media This guide has been printed on eco-friendly paper. Come along and experience the spectacular Kunsthal building designed by Dutch architect Rem Koolhaas! This edition has been compiled with the greatest possible care. Rotterdam Info cannot be held liable for any inaccuracies or changes.